No matter how beautiful and tidy your car is, the trunk will always be filled with stuff that you don’t need and the ones that you truly need will be disorganized and thrown all in there. So, whenever you need something from your trunk, it might be difficult and frustrating finding what you are looking for. Although some people are more organized than others, when you have kids, a big family or you are simply one who enjoys taking road trips every week, you don’t have the time to clean the trunk regularly. Car trunk organizers can be of great help if that is the case. These products come in the shape of a box, but aren’t covered. They have thick sides and bottoms, come with buckles or strap-on systems, so you won’t have to worry about the entire organizer moving in your trunk while driving. The fact that they are large and roomy, that their size can be easily adjusted and that they are foldable and easy to store makes them comfortable to use. Every car owner should own a car trunk organizer. Such a product helps you stay organized in no time, as it has a large number of compartments and pockets where you can store everything that you have in your car. There is no need for all your stuff to be chaotically thrown in the trunk, as you will only get frustrated. If you are looking to buy an organizer right now and you haven’t reached a conclusion as to which are the best models out there, you have come to the right place. We have selected 5 of the most popular products on the market and analyzed them thoroughly. We then reviewed them and highlighted their pros and cons based on personal observations and consumer feedback. Check them out below and see which one is the most suitable for your needs. When buying a car trunk organizer, you surely want to find one that doesn’t occupy the entire space, but at the same time, you want it to have several pockets, separators and compartments. 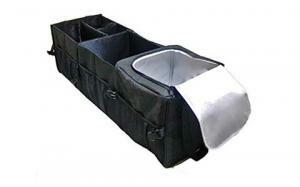 Car trunk organizers are extremely useful as they can help you organize everything that you have in your car quickly. 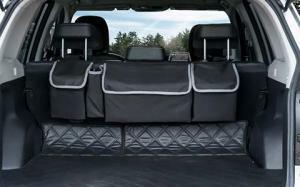 This product from TrunkCratePro is one of the best options that the market has to offer. It has a good price, it is large enough to fit a large number of items and it is made of durable materials. 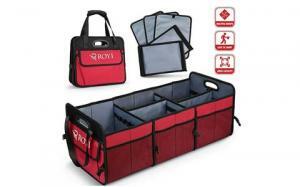 Giving the fact that it is a heavy-duty organizer that measures 23.6 x 14.6 x 12.5 inches, this model is ideal for larger vehicles, such as SUVs or mini-vans. Being made of Oxford polyester, you will not have to worry about its durability. More than that, it is water and abrasion resistant. It has reinforced stitching, it has a multi-faceted design, 3 compartments, some sub dividers and several pockets. It can be folded easily when not used, it is lightweight and easy to store. In order to prevent it from moving while you are driving, the manufacturer has included straps that you can use to secure it. Thanks to its nice design, it can be used as an organizer for the back seat or even your garage. Another great option is this organizer from Tomser that comes in red, has a large capacity and comes with a lot of compartments and pockets. If you are looking for a sturdy trunk organizer that has handles and mesh pockets that help you store small objects, then you will love this product. It comes at a great price that anyone can afford, it has 3 large main compartments, 6 small mesh side pockets, as well as 3 large mesh side pockets. Its large side pocket has a cover, so that you can store objects that should not be in plain sight. Also, it has 2 more medium side pockets that are covered, too. Thanks to its large size, it is compatible with vehicles such as SUVs, minivans, trucks, but also with small cars that have a larger trunk. However, if you have a small car, you can also fold one of its sides. This organizer has 6 buckles that help you adjust it or keep it flat whenever needed. It comes with a stiff base that adds more support and has 2 removable sub-dividers. It is made of waterproof material that will protect the objects inside. Also, this makes it very easy to clean. It has a 3-layer design, reinforced stitching and the ability to hold up to 100 pounds of weight. This product measures 30.6 x 11.6 x 12.8 inches and weighs 4.7 pounds. By comparison to the previous 2 products in our list, this one is even larger and offers an insulated compartment that can prove to be very helpful, especially during long trips. It comes at a great price and it offers value for money. Its extra-large size is suitable for large vehicles. It has a premium design with a side strap that allows you to secure it as best as possible. This product is made of Oxford Polyester, it is water resistant and easy to clean. Thanks to its uniform stitching, it is more durable and reliable than other similar products. If you want a trunk organizer that is versatile and offers you a lot of storage space, then the 16 pockets of this product will be perfect for you. It has 12 elastic pockets, 2 front pockets and 2 on the side. It is comfortable to carry, as it comes with 2 strong handles that have been designed with comfort in mind. Besides having a large number of pockets, it also comes with internal dividers that you can remove according to your needs. Its non-slip add-ons and its safety buckles will keep it in place at all times. The best feature that this organizer has to offer is its insulated compartment, where you can keep your food and beverages during the warm season. However, you should not mistake it for a cooler. This model measures 36 x 12 x 12 inches and 15 x 13 x 5 inches when folded. 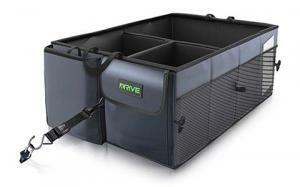 Yet another car trunk organizer that can be bought at a really low price is brought to you by Drive Auto Products. This is a model that really intends to save as much space as possible and you will observe it immediately. It has a compact space, large compartments and a shape that doesn’t get easily distorted. Organizers that are made of very soft materials have the tendency to occupy more space than initially intended, due to the fact that they expand. This one is made of harder materials, so it maintains its shape. It comes in 3 colors, so you can choose between grey, black and tan. This trunk organizer has been designed to last. It has 3 layers of materials: a sturdy insert, a foam panel and a waterproof layer. It is durable and reliable and comes with side mesh pockets, covered pockets and large compartments. It has tie-down straps that allow you to secure it while driving, so that your stuff will not be found all over the trunk at the end of the trip. It has reinforced carrying handles and a collapsible design that makes it easier to adapt it to the size of your trunk. When thinking about buying a car trunk organizer, the first thing that goes through your mind is probably the fact that it will occupy a lot of space. Paradoxically, so are the tools, accessories and objects that you keep in there. Even so, there is a way of saving a lot of space, keep your trunk organized and also almost empty. This product here is extremely affordable and practical. It is nothing like the other products in this list, as it doesn’t have a rectangular shape and it doesn’t have to be placed right in the trunk. It is large sized, but it is designed to be buckle strapped around the headrests on the back seat. This way, it doesn’t occupy any of the trunk floor space. It has 4 main compartments, large and deep pockets; it is made of heavy-duty materials and can support a lot of weight. Thanks to its hook & loop system, you will not feel it moving while travelling. This is one of the most comfortable to use trunk organizers that you can find and it is also very cheap. It is compatible with SUVs, compact cars, mini-vans and practically all car types. To make sure that it will be easy to attach to the headrests measure the distance between them before ordering. This trunk organizer measures 36.2 x 4.8 x 11 inches and weighs no more than 1.3 pounds. Is your car trunk the most chaotic place that you have ever seen? If yes, then you urgently need an accessory to help you organize it or you will never be able to find anything there. Car trunk organizers these days are super easy to use, extremely practical and inexpensive, too. It is a pity to drive a car that is filled with unnecessary stuff or one where you can never find anything when you need it the most. The products in our list are all high-quality car trunk organizers. Some are larger are suitable for longer trips, while some are medium and have adjustable size. Depending on your need and preferences, you could choose a model that is suitable for a very large trunk, or one that can fit even in the smallest car. Also, you could go for a basic model if all you need is to organize the items in your car or you could choose a model with insulated compartments if you like to take longer trips.